For more than 35 years, Dave Dembert has provided counsel to individuals and multi-generational families, professionals, closely held business owners and fiduciaries regarding their estate planning, estate and trust administration, tax, business and real estate matters. Dave integrates his tax, accounting and financial planning background with his legal education and experience, so as to provide a comprehensive and personal approach to his clients. In his estate planning practice, Dave works with his clients to identify goals and objectives, educates them on the relevant tax and legal ramifications and prepares all necessary documents to implement the planning. His tax background enables Dave to not only advise individuals and fiduciaries on the tax planning, but also prepare all necessary income, estate and gift tax returns. Dave’s business experience and knowledge allows him to be an effective advocate for clients engaging in a multitude of business and real estate transactions, including entity formation, drafting and negotiating employment and stockholder/operating agreements, operational agreements, leases and business/real estate acquisitions and sales, together with related financing matters. Dave has been actively involved in many alumni leadership roles for his alma mater, Bucknell University, and for other charitable and educational organizations. 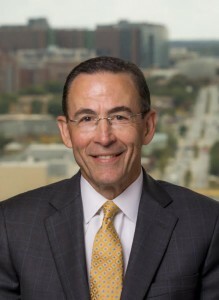 His professional focus has been in two primary areas; namely, the Estate and Trust Law Section Council of the Maryland State Bar Association, of which he is a voting member and Past Chair, and the Baltimore Estate Planning Council, of which he is currently serving as Immediate Past President. Dave and his wife, Julie, a real estate consultant, have two adult sons, Mike and Eric, who are professionals working and residing in the Baltimore-Washington metropolitan area.